You know how sometimes Patrice says that she hesitates to mention when Jonah's doing really well because it seems like as soon as she does, he has a setback? WELL. I should have known better than to write a post about a "normal" day and being happy for our good health, because after I set it to post on Saturday night for the following morning, the sky fell down. Well, over the last several days, his RSV symptoms (EPIC drainage, labored breathing, bad cough) had resurfaced after a couple of weeks of relative absence. At bedtime on Saturday night, he had fussed and fussed when I put him down, which is VERY unlike him ... he is an easy-to-bed child and always has been. Around 1:00 as I was heading to bed, I walked in his room to drop a couple of clean pacis in his bed, and he sat up quickly and reached out his arms for me to pick him up. He was exhausted but also wide awake and just wanted to be held. I rocked him for a while in his room and timed his breathing ... his respirations were between 60 and 70, but he was working really hard with each one. His tummy was retracting with great force and he could barely lift his head when I talked to him. I decided to go ahead and call the after-hours nurse, and long story short, she told me to take him on downtown to Children's. I slipped a sweatshirt on him and we headed out in Grayson's car. We were taken back and triaged after about an hour, and at that point his pulse-ox was 97 on room air ... great! Only that didn't jibe with how he was presenting visually. 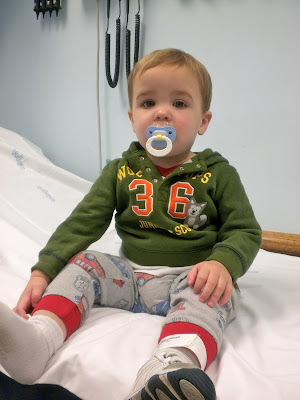 He did have a little wheezing, so we got sent on to an exam room to wait on a doctor. Jakey was a little worried at this point, but he was hanging in there. He really didn't like having the pulse-ox monitor attached to his toe inside his sock, though. However, the pulse-ox monitor was the LEAST of his worries ... when the nurse came in and suctioned his nose with the bulb syringe and saline around 3:30, he completely fell apart. UNPOPULAR! UNPOPULAR! I couldn't take pictures of the screaming because I was in charge of holding his arms and feet down while the torture commenced. But he really tuckered himself out with that little fit. The resident who assessed him ordered a chest x-ray to make sure his lungs were OK, and I didn't get pictures of that, either. We threw another big fit in there, but again I was in charge of appendage control and couldn't take any pictures. The x-ray showed some isolated spots in his lungs, but it wasn't pneumonia, which is what she wanted to rule out. It appeared to be the more simple bronchiolitis, which is what Grayson has had since Disney World, but it was causing more severe symptoms because of the already-present RSV. His sats were hovering in the low 90s on room air, which was a little lower than we would have liked. Next we tried a breathing treatment (with Albuterol) around 5:15 to see if that would ease up his breathing a little bit. After we finished that one, he slept for a little while. He was peaceful but also still struggling a little bit in his sleep to breathe. His trusty pulse-ox monitor kept me apprised of his sats. I'd expected it to go up after the treatment, but it went down. I couldn't really tell a difference in him visually, but I kept a closer eye on him at this point. After he'd been at 90 for a couple of minutes, it started blinking red. That bothered me a little, and I went out to get the nurse ... he came in and it dropped at some point down to 85, then came back up to 87 ... but it was sporadic and strange. We woke him up and got him upright (he was mightily pissed off about that) and we did a second treatment that lasted for 40 minutes, hoping that we could get him in better shape to be able to go home. The attending came in to see us and said that if he stayed that low after the second treatment, they'd admit him. We grabbed his little Attending Bear Doctor that the nurse had given him, our prescriptions for the oral steroid and Albuterol, and our discharge papers and got out of there! We were on the way home by 7:45 and got there after Nick and Nathaniel were already awake ... waiting anxiously for us to get home. Jakey had NO desire to go upstairs and sleep; he gave each of the boys a big hug and then wanted to play with them immediately. SO SWEET. I went upstairs and slept from 8:15 to 1:15 while Grayson watched the boys ... the sleep felt SO GOOD, although there wasn't enough of it. Jake eventually slept for just two hours later in the day but went to bed without much of a fuss last night at 8:00 after another breathing treatment. Hoping for a good start to the week ... Please keep him in your prayers! My goodness, I am so sorry that your Saturday turned into such a untypical Saturday. I will certainly keep Jake & YOU in my prayers. Have you told your guys that you will be going on their honeymoons... to take pictures? Wow! We've so been there. We probably have 5 of those little dinosaur masks at our house. The baby gets the dinosaur. Our five year old got a fish mask one time and we guard it very carefully. We were up last night doing breathing treatments too. Hope the poor little man feels better soon. Breaks my heart. BREAKS MY HEART! My first comment on your blog! So sorry to hear about Jake. That's scary stuff. I will be praying that it clears up quickly! Rachel, I'm so sorry to hear that! I didn't know your family struggled with breathing, as well. Is it asthma? New Sarah, that's so cool! Jakey will be thrilled! And thanks so much for delurking to say hello.